Nonviolence is a philosophy that rejects the use of physical violence. People who practice nonviolence when expressing their beliefs may use methods like education, persuasion, civil disobedience, and conscientous objection to military service. 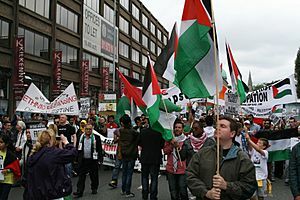 A demonstration by a group of people in a public place, to show their support or to protest, is permitted on the condition that it remain nonviolent. 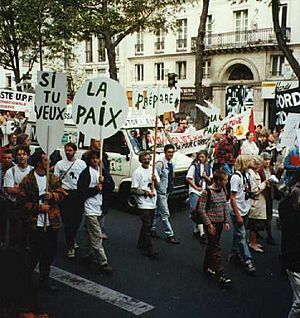 Sometimes the demonstrators are nonviolent but other people who oppose them will come to the demonstration and behave violently to show their opposition. Some religious movements, such as the Society of Friends (Quakers) and Jainism, are known for the practice of nonviolence. There are people who adopt nonviolence in midlife, such as St. Francis of Assisi. People who eat a vegetarian or vegan diet, and those who support animal rights, usually oppose any violence by humans against animals. Mohandas Gandhi, often considered a founder of the nonviolence movement, spread the concept of ahimsa through his movements and writings, which then inspired other nonviolent activists. Martin Luther King speaking at the 1963 "March on Washington". Nonviolence Facts for Kids. Kiddle Encyclopedia.